“The tragic attacks on Gaza emphasized the need for unity — the Palestinian people as a whole were targetted, and it’s very clear that we need to stand together to protect our national rights — first and foremost, self-determination”, Ashrawi said. France said yesterday that it would vote in favor of the resolution upgrading Palestine’s status to state — as will Spain, Portugal, Denmark and others. The Jerusalem Post’s Tova Lazaroff sent out a Tweet citing Reuters saying @tovahlazaroff: “13 say yes to PA UN bid: Austria Denmark Norway Finland France Greece Iceland Ireland Luxembourg Malta Portugal Spain & Switzerland”. UPDATE: U.S. State Department spokesperson Victoria Nuland said in the regular daily briefing for journalists on Wednesday that “Deputy Secretary of State Bill Burns and our Special Envoy for Middle East Peace David Hale did go up to New York and see President Abbas this morning. As you know, we meet with him frequently. The Secretary [Hillary Clinton] saw him just some 10 days ago when she was in Ramallah. They obviously had a discussion about the peace process, but they also reiterated the U.S. Government’s very real concern about the Palestinian initiative in the UN General Assembly. We’ve been clear, we’ve been consistent with the Palestinians that we oppose observer state status in the General Assembly and this resolution. We made those points again. And the Deputy Secretary also reiterated that no one should be under any illusion that this resolution is going to produce the results that the Palestinians claim to seek, namely to have their own state living in peace next to Israel. So obviously we went up to make one more try to make our views known to President Abbas and to urge him to reconsider. He’ll obviously make his own decisions, and he will do that in New York tomorrow. But we thought it was important to make our case one more time…[T]his resolution is not going to take them closer to statehood. It does nothing to get them closer to statehood, and it may actually make the environment more difficult”. The full briefing is posted here. But, Ashrawi said earlier, in her press conference in Ramallah on Wednesday, that Israel and the United States [and any other countries who will probably not support this resolution], “will find themselves on the wrong side of morality, of justice, and of law”. Israel has denounced the move as a ‘unilateral” step which runs counter to the Oslo Accord between Israel and the PLO. But, Ashrawi said, this cannot be misconstrued as a unilateral step, when it is not. “If there are to be negotiations, this would form the basis of negotiations — without pretending that our territory is under dispute or up for grabs”, she told journalists. Israel’s chief concern, it has emerged through media statements and through the efforts to negotiate the Palestinian request to the UN, has been that once classified in the UN as a state, Palestine could then lodge complaintes against Israel at to the International Criminal Court or other fora, including the International Court of Justice. Ashrawi previously seemed to suggest, several months ago, that if Israel committed no war crimes after the date of Palestine’s accession, the matter would be moot. But today, she said that “If Israel refrains from settlement activities … there is no immediate pressing need to go … [though that could change if]”Israel persists in its violations.”. She also said: “if Israel is not guilty of war crimes or crimes against humanity, then it has nothing to worry about”. Ashrawi added “it is our right to join all international organizations and agencies”, and pointedly stressed that “it will be a Palestinian [only] decision”. “We have not succumbed to pressure”, Ashrawi stated. UPDATE: Bernard Avishai, American-Israeli academic + blogger/writer, posted a piece, here, on The Open Zion section of The Daily Beast a piece about the UNGA move: “We hear much about the danger of Palestinian diplomats, newly elevated to representatives of an observer-state, bringing action in the International Criminal Court against Israeli officials and officers linked to settlements—a back-handed acknowledgement, curiously, that settlements are seen as a contravention of the Geneva Conventions everywhere but in Israel”. 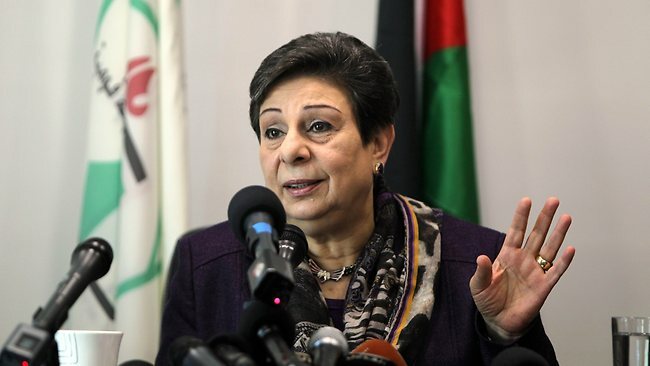 Ashrawi said to journalists in Ramallah on Wednesday: “Why are we going to the UN?”, she said. “First, to ensure the Palestinian right to self-determination, and to define Palestinian land as it is — under belligerent Israeli occupation”. And, she added, “it also says that Palestinians have rights”. “It will also be empowerment for the Palestinian people”, Ashrawi added. “We are not a non-people…It is a moral and legal move to send a message of hope to our people”. All presentations that Abbas made to his people in the Arabic language made it clear that his concept of an “observer state” will include all of Palestine, “from the river to the sea”, in accordance with the PLO Covenant, which was never cancelled.